A better alternative to concrete replacement. Concrete raising, often referred to as slabjacking or concrete leveling, is a fantastic alternative to repairing or replacing concrete slabs. There are two different methods for raising sunken concrete: mudjacking (sometimes referred to as slab jacking) or polyurethane foam concrete raising. The process for raising concrete, whether by mudjacking or by polyurethane concrete raising, is very similar—differing mainly by material pumped. Simply put, holes are drilled into the concrete slab, mud material or polyurethane foam is pumped under the slab, and the voids under the concrete slab(s) are filled, thereby raising the slab. Finally, the drill holes are patched with a concrete mixture to complete the process. Raising concrete tends to be half the cost of replacing the concrete. Here at HMI, we have over 40 years of experience manufacturing concrete raising equipment, materials and systems to raise and level concrete. Not only do we manufacture some of the industry’s best equipment and materials, but we also use them to provide concrete raising services through our sister company, RaiseRite; needless to say, we know what’s important for raising concrete the right way. 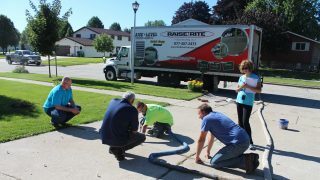 There are many things that can cause concrete to settle, all of which do not always require concrete replacement to fix. Climate: The Polar Vortex experienced last year by many in the northern hemisphere wreaks havoc on concrete slabs. Freezing and thawing causes slabs to expand when frost is in the ground. Frost causes concrete to heave or raise. When the ground thaws, the concrete will settle again, but many times not to where it was originally. This results in trip spots between shifting slabs.On the opposite end of the climate spectrum, heat and drought can cause expansive clay soils to shrink, causing concrete slabs to settle. When those clay soils receive much needed rain and expand, the concrete slabs become unlevel. Erosion: Damaged water or sewer lines, improperly placed downspouts, excessive rain can all lead to washout of base materials under concrete causing slabs to settle. Slab Curl/Rocking Slabs: Slab curl occurs when a relatively large section of concrete is poured. During the curing process, the top slab may cure slightly faster causing the slab to curl, rock, and become unstable. Vibration can also cause slabs to settle. There has always been a high demand for concrete leveling and raising. Settled concrete needs to be addressed, not only from an aesthetic standpoint, but, more importantly, from a liability standpoint. How can you learn to raise sunken concrete? Simple! We offer a 2 Day Discovery & Training Seminar that focuses on teaching what you need to know to successfully run a concrete lifting business. Explore the different options you have in equipment, learn business operation best practices, and get the marketing guidance you need to start your concrete raising business. Ready to learn more about how to start a successful concrete raising company?